VIDEO: Audi R8 RWS vs Porsche 911 GT3 — Which is faster in the wet? The Audi R8 is largely considered the best all-weather supercar, thanks to its near unflappable Quattro all-wheel drive system. So it’s ironic that when Auto Express decided to pit the Audi R8 RWS (Rear-Wheel Series), the two-wheel drive and less all-weather capable version, against the Porsche 911 GT3, the sky decided to open up. In this latest video review from AE, they took the Audi R8 RWS and the Porsche 911 GT3 to the track and it just so happened to pour. Which made the comparison test a bit tricky but actually quite interesting. It was a good chance to test both cars against each other in poor weather conditions without the R8’s bad-weather insurance — Quattro. What’s also interesting is how similar both cars are once the Audi ditches its all-wheel drive. Both use free-breathing, naturally-aspirated engines, both have their engines sitting behind the driver (mid-engine for the Audi, rear-engine for the Porsche), both make 500 hp-plus. both have seven-speed dual-clutch gearboxes and both are rear-wheel drive. So they’re remarkably well-matched. The biggest difference between the two is tire fitment. The Audi R8 RWS came shod with Pirelli P Zero summer tires while the Porsche came with Michelin Pilot Sport Cup 2 extreme performance summer tires. The latter of which hate the cold rain more than almost any other tire. So which is more powerful? 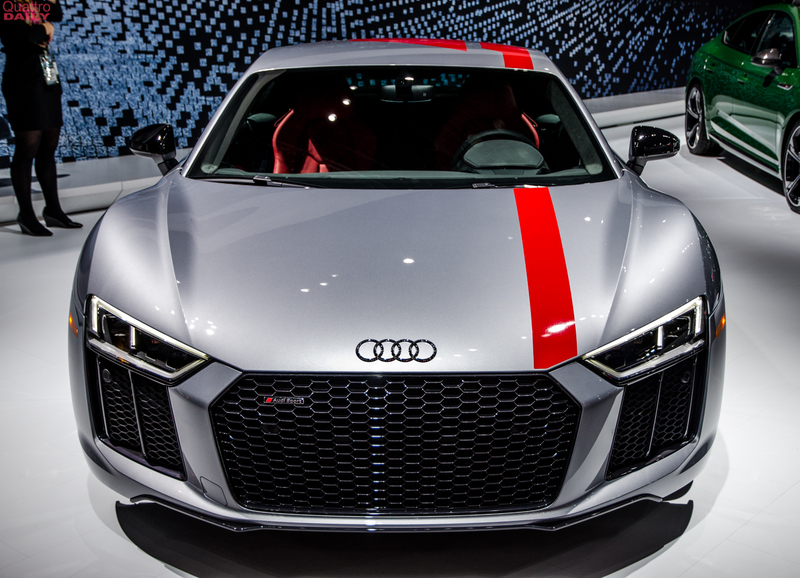 The Audi R8 RWS uses a 5.2 liter V10 with 540 hp and the Porsche 911 GT3 uses a 4.0 liter flat-six that makes 500 hp. So the R8 RWS has a bit if a power advantage but the 911 GT3 is considerably lighter. But, more importantly, which is faster? Auto Express’ Steve Sutcliffe decides to do some flying laps in both and we get to see an on-board view of each lap simultaneously. It’s fascinating to see how each car handled the lashing conditions. The Audi R8 RWS seemed like far less of a handful, with Sutcliffe needed quite a lot less steering corrections. The Porsche 911 GT3, with its far too aggressive tire, was much trickier, constantly spinning its rear tires on corner exit, requiring far more corrective steering lock. Thanks to the 911 constantly stepping out, the Audi R8 RWS was over three seconds faster. Though, that’s likely due to the choice of tire for each car and Sutcliffe reckons the Porsche would definitely be quicker in the dry, where its tires would become an advantage. Still, in the rain, on the tires they had, the Audi R8 RWS was fastest.